If you’re looking for something special to do on Valentine’s Day you’ve come to the right place. A new concert venue is coming to Pasadena, sister club to the enormously successful Canyon Club in Agoura and the Saban Theatre in Beverly Hills. East Side, West Side, All Around the Town—The Rose at Paseo Colorado, 300 E. Colorado Blvd # 101, Pasadena, CA 91101. So who do they get to open their new venue? Judy Collins on Valentine’s Day—who else? Sunday, February 14 you can take your old flame, your new sweetheart, or your wife to a great concert at a new supper club on Colorado Blvd in Pasadena. The last time I saw Judy Collins was at the Levitt Pavilion in MacArthur Park last July 27th. And I took some notes so as not to forget the experience. Let me reintroduce you to her amazing grace if it has been a while since you have had the pleasure of her company. There are a lot of senior citizens at the Levitt Pavilion—including myself—but for an hour-and-a-half we are all young again—in the still confident and youthful voice of Judy Collins, just as beautiful as when she sang Yeats’ great poem Song of the Wandering Aengus, the one that ends with the title of her second album—Golden Apples of the Sun. Judy Collins starts right where she ended this evening—with her Irish roots and a personal paean to Ireland. Her song is as beautiful as the Emerald green countryside. But Ireland isn’t the only destination on her journey of rediscovery tonight; she also takes us back to her roots in our neighbor to the North—Canada—specifically the Canadian songwriters she championed early on in her career. I Hear America Singing, wrote Walt Whitman; the Good Grey Poet would have loved Judy Collins. She did for Canada what Whitman did for America—she heard Canada singing. She brought her greatest modern songwriters into the American mainstream by recording their songs at a time when they were all unknown, unsung and unheard of south of our northern border. Tonight’s concert is a primer in how to integrate the past—which Faulkner reminded us “didn’t go anywhere”—and present into one seamless whole. It is also a guide to how Collins began her brilliant early discoveries of four of the major songwriters of our time—all of whom come from Canada. She gets a call from Al Kooper one night—the Al Kooper whose definitive organ part makes Dylan’s Like a Rolling Stone sound like the wild mercury Dylan hears in his head—but can’t find anyone to play in the studio until Kooper comes along. Kooper asks Collins for advice on what to do about his new girlfriend, whom he describes as both beautiful and a gifted songwriter. Collins sagely tells him, “Well then you can’t lose; if it doesn’t work out at least you’ll have her songs to remember.” But Collins’ curiosity is aroused and she wants to hear those songs too. They turn out to be Both Sides Now and The Circle Game, and Kooper’s new girlfriend turns out to be Joni Mitchell. In 1967 Judy puts these then unknown masterpieces on her new album and Mitchell’s career is launched. Leonard Cohen is a minor poet and novelist from Canada who has never written a song until a mutual friend lets Collins know that “this obscure writer from Canada” (whom Collins first describes as “this obscene songwriter from Canada”) may be worth her meeting. Collins invites him over and Cohen introduces himself by saying he “doesn’t know whether this is even a song or not.” He asks if Collins will listen to it and give him her opinion. He also tells her he “can’t play guitar and can’t sing” but will try to get through it. A more inauspicious introduction could hardly be contrived; and then Cohen stumbles through his first fledgling effort. When he looks up afterwards he doesn’t ask if it is a good song—just “Is it a song?” “Oh, it’s a song all right,” Collins replies, “and I’m recording it tomorrow.” Suddenly, thanks to Collins, the obscure author of Beautiful Losers becomes the famous author of Suzanne. Judy Collins not only talks about the highs of finding great songs and songwriters though; she is most captivating when she talks about the self-destructive lows of her struggles with the demon of alcohol and how folk music literally saved her life. During a particularly bad period she has a booking at a small folk club in Chicago and when she gets there looks like a haunted shadow of the glorious troubadour we saw last July 27—more like a female version of Llewyn Davis at his most desperate from last year’s hit movie about the early days of the folk music revival in Greenwich Village. When the club owner sees her the first words out of his mouth are “You’re sick.” She takes it as a typical ‘60s bohemian observation, as in “Lenny Bruce has a sick sense of humor” with no larger import, but he insists, “No, you’re really sick; we need to get you to a doctor.” It turns out she has tuberculosis and doesn’t even know it. Like Jimmie Rodgers she could have died from the TB Blues did not a thoughtful folk club owner intervene and save her life; one of the real life compassionate scenes that never make it into the movie about the self-obsessed club owners who help to destroy Llewyn Davis. Judy Collins gives us the real story—the kind of story that is too good for the Coen Brothers. She also sees the humor in a real-life episode of ER; before she gets to the hospital—not knowing how long she may be incapacitated—she insists on stopping for a six-pack of beer and a couple bottles of Kahlua to hide in her bags—“I was not going to go to the hospital unprepared.” Judy Collins is now an out alcoholic willing to expose her once secret life for others’ benefit. And not just her alcoholism, but her battle with depression recounted in her memoir Sanity and Grace, written in the wake of her son Clark C. Taylor’s suicide in 1992. She is all there on stage—Fitzgerald’s both the beautiful and the damned with nothing left to hide. That openness as a human being is what gives her songs such resonance; she sings every song as the whole person who has lived them as well as sung them. Each vignette—such as Jimmy Webb’s The Moon Is a Harsh Mistress—rings true because she surrounds it with the humanity that first drew her to it. is the first song she writes at Cohen’s suggestion, and the one that ends the Judy Collins Songbook—which she signed for me at a Santa Monica bookstore. Her warmth and generosity reveal themselves in her gracious acknowledgment of both her sound man (George Williamson) and crew who “make me look and sound like Judy Collins.” She also thanks several times her great musical arranger who plays piano brilliantly all evening—her music director Russell Walden. And we are fortunate to hear her for free at the Levitt Pavilion—the poor man’s Hollywood Bowl—Summer Concert Series in MacArthur Park. She gives us Joni Mitchell’s Both Sides Now and Chelsea Morning, which she sings so beautifully after making a lovely spoken tribute to Joni Mitchell, as the “beautiful bird who is sick on the other side of town” (at UCLA hospital). She wishes her a full and speedy recovery, which says all that needs to be said—even though Joni’s illness seems to be more serious than that wish implies. Six months later and we are still praying for her. To hear Judy Collins sing the work of a first-rate songwriter shows just how much we owe her, since it is largely through Collins’ amazing voice that we came to appreciate just how amazing those songs of Mitchell’s are. The same could be said of her versions of Leonard Cohen’s songs. It is through Judy Collins that Leonard Cohen becomes a household name—at least among certain households. And fortunately for this listener she reaches all the way back to her 4th album—the Judy Collins Concert Album from her sold-out Carnegie Hall concert of December 22, 1963—for West Virginia native songwriter Billy Edd Wheeler’s Coal Tattoo—the one full-frontal political song of the night. She introduces it with a few words of support for the beleaguered union movement she still champions after all these years. To show which side she is on, Judy Collins headlined the September 5 Labor Day concert in Salt Lake City, Utah, to commemorate the Centenary of the execution of labor’s greatest troubadour and martyr—IWW songwriter Joe Hill—who was murdered by firing squad in Salt Lake City November 19, 1915. The concert ends with her Stephen Sondheim bittersweet hit Send In the Clowns. 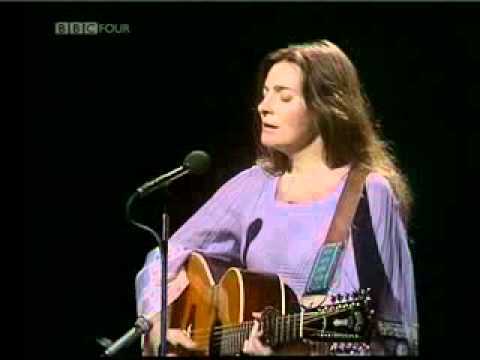 Thank the gods of folk music for encores, because after the clowns are told “Well maybe next year,” Judy Collins returns from behind the curtain and puts down her Judy Collins Signature Model 12-String Martin Guitar and with just her amazing voice sings John Newton’s hymn Amazing Grace. That is amazing enough for me, and for one night at least, against a world at war with a domestic terrorist breaking into a gun-free zone Marine recruitment center, how sweet the sound. For one more night, Judy Collins sends us home with a heart held together by a slender thread of hope. Bravo! Thank God Judy is still here, with grace to lead us home. And yes, her eyes are still blue, and her voice is still glorious. “There are heroes in the seaweed,” writes Leonard Cohen; and a long time ago they show her where to look “amid the garbage and the flowers.” These are the places where Collins always finds her best songs—including “the toughest road I know.” So before I forget thank you for singing Ian Tyson’s Someday Soon—the highlight of the show for me. Yet another great Canadian songwriter you helped bring to light, along with Gordon Lightfoot—through Collins recording of Early Morning Rain. Joni Mitchell, Leonard Cohen, Gordon Lightfoot and Ian Tyson; without Judy Collins they might still be singing in coffee houses in Ontario. That is a debt that can never be repaid. So for us, and for them, thank you Judy Collins. Because of you, we can all hear Canada singing. Welcome back, Judy! Happy Valentine’s Day. Judy Collins performs at the Rose in Pasadena Sunday, February 14; the Canyon Club in Agoura, Friday February 26 and the Saban in Beverly Hills, Saturday February 27; see the FolkWorks Music Calendar for the dates, times and links. Saturday March 5 from 5:00pm to 7:00pm Ross Altman will perform a program of Woody Guthrie Dust Bowl Ballads and popular songs from the 1940s at the opening of a book exhibit about photographer Dorothea Lange and her classic Dust Bowl portrait Migrant Mother, Nipomo, California 1936, at the Old Town Newhall Library, 24500 Main St. Santa Clarita, CA 91321 661-259-0750 . Saturday March 12 at Theatricum Botanicum in Topanga Canyon Ross Altman performs in their third tribute to the late Pete Seeger—RePete 2016! See their website for details. Sunday May 15 at 4:30 PM on the Railroad Stage at the Topanga Banjo-Fiddle Contest Ross Altman performs his new show When a Soldier Makes It Home: Songs for Veterans and Their Families; for information about their 56th annual folk festival.